These ship best via freight. If you order them along with a chiller, or several fan coils at once, that's not an issue since they would go via freight. On single fan coil orders though, we have found that UPS damages 50% of them and then drags out the claim process. Therefore, we suggest using freight even on single fan coil orders instead of UPS. 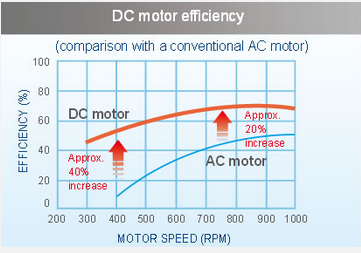 DC-Inverter fan motors run more efficiently and use less power than regular fan motors. Additionally, they are far quieter than a standard fan unit, you can hardly hear them running. And using a hermetically sealed fan motor means years of trouble free service because dust, salts, acids, and moisture cannot get inside. Did we mention more efficient? DC-Inverter fan motors use up to 75% less electricity to do the same job. Chiltrix Ultra-Slim DC-Inverter CXI FCUs are 110-130V 60Hz. The Chiltrix CXI-series FCUs are the thinnest and quietest ductless chiller fan coil units available. They also use far less electricity to operate than any standard fan coil unit. The HW series is a standard high wall design of standard efficiency. 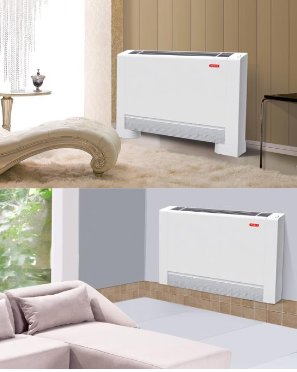 The Chiltrix CX-series chiller heat pump units can work with nearly any brand of fan coil unit, ducted or ductless, as well as hydronic in-floor systems. Chiltrix DC-Inverter Ultra-Thin CXI series FCUs are built for universal mounting and use 120v, they can mount on the ceiling, wall, or floor. 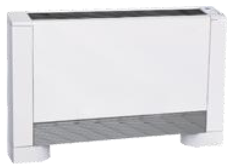 The CXI series DC-Inverter fan coil units are the quietest FCUs in the market. The Chiltrix CXI-series FCUs (Fan Coil Units) are available in four different sizes from .28 ton to 1 ton. These DC-Inverter fan motor FCUs are the most efficient fan coils available on the market, using far less energy at any given speed than a standard fan coil unit. The ability to adjust the speed of the motor without compromising efficiency is a crucial additional benefit. Designed for the Chiltrix CX-series chillers of ultra-efficient chillers, these fan coils are also compatible with all chiller systems. The Chiltrix CXI DC-Inverter FCUs are an incredible 5.1” thin. These fan coil units can attach flat against the ceiling, stand on the floor, or mount flat on a wall, depending on how you mount them. These units are the thinnest fan coils available yet produce more BTU/CFM per watt of power than any standard fan coil unit. DC-Inverter fan motors last longer and produce far lower sound levels than a standard fan motor with sound levels as low as 24dB. The Chiltrix fan motors are hermetically sealed brushless DC motors that use permanent rare-earth magnets. The DC motors are essentially vibration-free and avoid the “hum” of conventional motors. Get more BTU/CFM per decibel than from any available unit. Standing next to the unit you cannot hear the motor operating, even on high speed. Whether it is used for a compressor, a pump, or a fan motor, DC Inverter motors are well known for being more efficient. They also run cooler, last longer, and produce a much lower sound level. DC Inverter motors have no actual inverter in them, AC power runs through a rectifier circuit converting it to DC power. The DC power is then pulsed in varying frequencies to rotate the motor. The higher the pulse frequency, the faster the motor turns. DC inverter motors are not only up to 20-40% more efficient at a given speed, they also provide the ability to efficiently match the motor speed to the real-time demand saving even more energy. A wireless remote control is included with each fan coil. Remember if you are ceiling mounting these, you might need a mini condensate pump depending on how you plan on routing the drain line.